Sapa is a lovely hill station town in Northern Vietnam near the Chinese border. 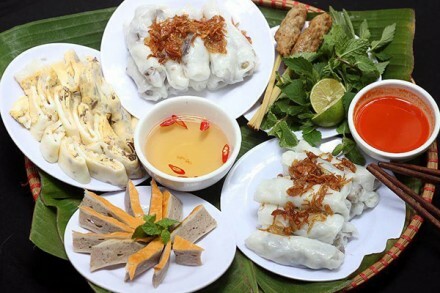 There are three ways to get Sapa from Hanoi such as motorbike, car, and train. However, this article spends for someone who wants to get the safe of Sapa motorbike tour. 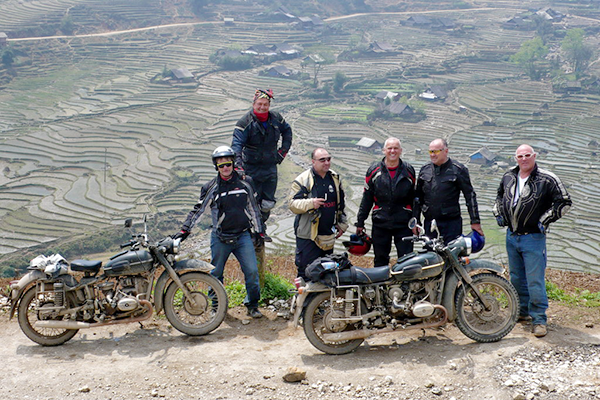 And we also offer the schedule of a trip in Sapa by motorbike for you. Of course, if you tend to book the tour, no doubt, their drivers have a lot of experience driving on the difficult mountain roads, so that you can experience Sapa in a safe way. On the motorbike tour, you will have the chance to see many of the minority villages and the beautiful landscape around Sapa. Advantages of a motorbike: Annually, a lot of tourists visit Sapa by this method to gain more experience during the journey. It makes more time to move on the road. You are comfortable to take photograph beautiful scenes and video the awesome moments while driving private. If you want to visit Sapa by motorbike, the suggestion for you is that putting your bike on the train, then driving to see the amazing scenery around you or rent a motorbike in Sapa. On the motorbike tour, you will have the chance to see many of the minority villages and the beautiful landscape around Sapa. 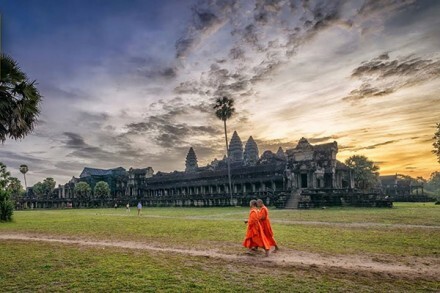 While on your trip, it is possible to stop any time if you want to take photos or just enjoy the beautiful view of the mountains and valleys. Of course, Sapa is the awesome destination in all seasons, however, from September to May is the beautiful time because, in Sapa, you can grace the stunning yellow winding rice-padded fields, the leaves trumpet and the love market. After arriving in Sapa town, you can check in your hotel and hire the motorbike to travel around Sapa. You will start this motorbike tour around 8:30 am at the Sapa O’Chau Cafe, where you will meet your tour guide. The first place on there is the mountain towards the Tram Ton Pass. But before stopping on Sin Chai Village, you should have a chance to through Cat Cat Village, just 2 kilometers trekking from Sapa Town Let then on the way to Sin Chai Village. Come here, you will learn about the life of Black H’mong people. On the way up you can view the village of Sin Chai below you getting smaller and smaller as the road climbs to the pass at 2047 meters. The trip will stop at the pass for you to breathe the mountain air while viewing the mountains and forests below. Sin Chai is a village of the Red Dao ethnic people, whose women wear beautifully embroidered clothes with distinctive silver jeweler and an enormous red turban. 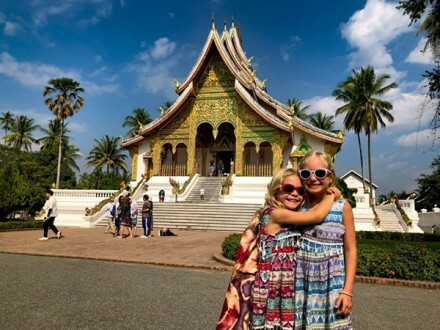 Take a walk around an ethnic minority village and interact with the local people, the very special thing is that, all the kids in the village will be your companions during the adventure as you will fall in love with them. They will be around all the time, singing, dancing or anything to make you smile. Moreover, you can teach them songs, poems that you used to love when you were a child. You continue driving back down to the Golden Stream and the Love Waterfall. In fact, Love Waterfall is the ideal place of relaxation as you have a chance to explore a legendary love story that has been told to generations in this land as well. If you stand from afar, the waterfall looks like a twinkling pyramid under the sun. With a height of about 100 meters, it starts from the peak of Fansipan Mountain and rushes noisily into the Gold Stream like a never-ending song. Under the waterfall, the Gold Stream runs along with green grass plots and bamboo clusters, forming a poetic image. In order to go to the Love Waterfall, you have to go on a red dirt road running through the lush and vast bamboo forest and gentle beauty of flowers with the various colors such as red, white, yellow, which creates the particular scenery here. Of course, you shouldn’t drive motorbike too late to avoid the challenges on the road. One suggestion for you is to check the performance of your motorbike before driving and look at the energy symbol to ensure the enough during the trip. After the breakfast, you continue following the tour guide to Matra and Ta Phin village, where many people belonging to the Red Dao minority live. You directly buy the handicraft products are eye-catching with numerous bright colors and patterns, ranging from bag, scarf, purse, to skirt, and even backpack and coat. In Ta Phin, you will have lunch at the Sapa O’Chau handicraft workshop. 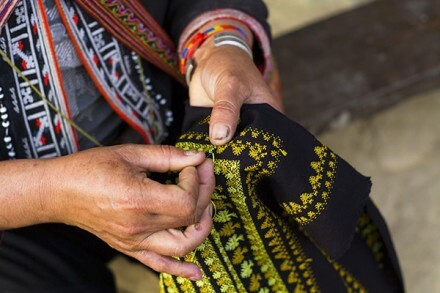 While waiting for the lunch, you can learn how the Black Hmong make their clothes and the local handicraft production by hand. After lunch, you will continue with the handicraft workshop for another hour. Then we will be on our way to villages of Sa Seng and Hang Da. On the way, you will have many opportunities to enjoy the incredible panoramic view of Muong Hoa valley and keep the photo album. You go to Muong Hoa valley where is one of the most famous destinations for many tourists. In the heart of the valley is Muong Hoa stream, 15 km length, where is the romantic place for local couples. The local also construct the wood bridges crossing the stream to strengthen ties with the neighbors. In the valley, there are many famous stones with many strange words and symbols which nobody can explain. When you visit Muong Hoa in the spring, you will have a chance to experience many local festivals with multi colors. Ending the trip on the second day, you will drive to Sapa town. 7:30-8:00 a.m: After finishing the breakfast, you will visit one of the local markets. Bac Ha markets in the Northern Vietnam in the Sapa tour 2 days 1 night are always the colorful meeting places for the hill tribes. 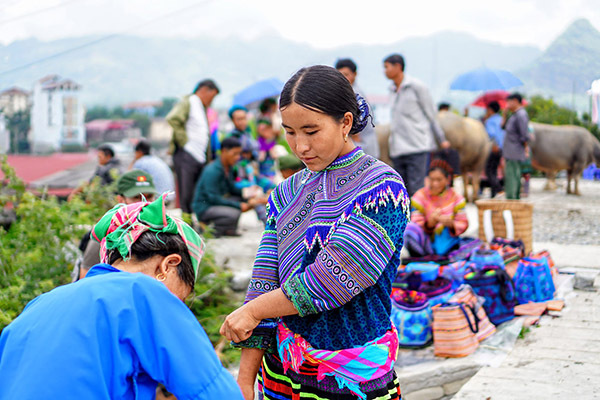 There are many ethnic groups like Flower H’Mong, Nung, Day… concentrate on the market with multi-color traditional clothes. Besides, you also enjoy the various foods of ethnic groups. Come here, you can find many handmade souvenirs to buy for your family and your friends. After that, let’s continue Sapa motorbike tour with Giang Ta Chai where you can grace the life of ethnic minorities, admire the spectacular natural scenery with the terraced rice fields. In the trip, you have an opportunity to trek Lao Chai, Ta Van village where you can see indigo dyeing by H’mong local people. 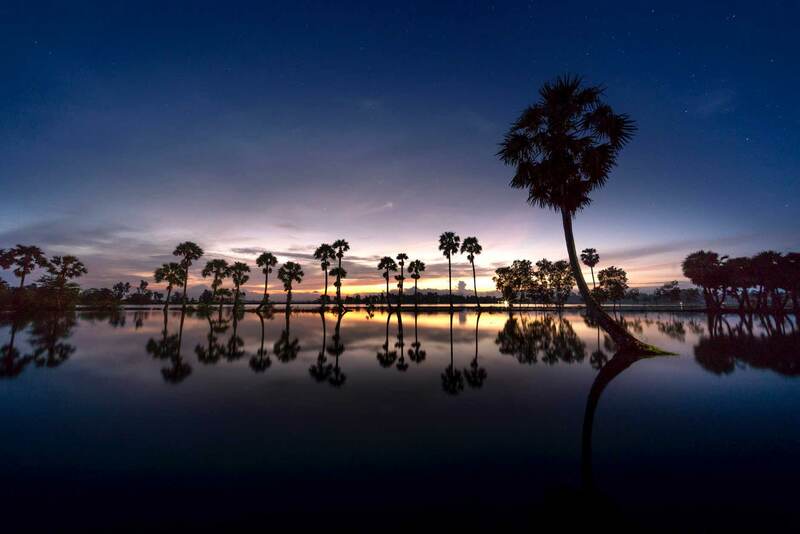 Coming to this village you know how they make their traditional clothes, handicraft, indigo… Otherwise, you will visit the biggest valley which offers to the awesome landscape of the golden rice terrace field in Vietnam. Then our tour tends to walk to Ta Van, a village of Dzay people. It is a small group of ethnic people living in Northern Vietnam, they still keep a rich and traditional culture. 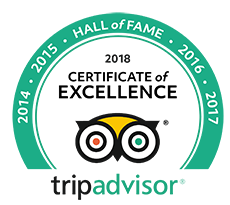 Finally, we ensure that you will have an awesome Sapa motorbike tour since you completely active in all activities of the journey. 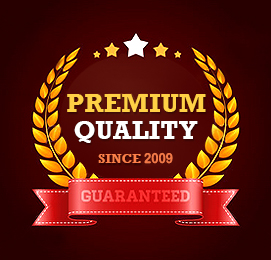 However, high recommendation for you is to check the quality of the transport before hiring. 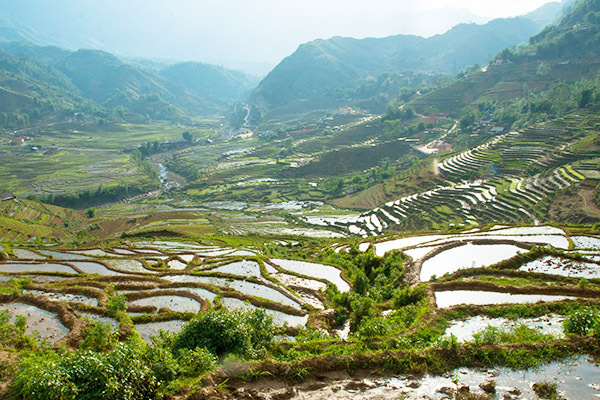 What Is the Best Sapa Package Tour?